Who are the Top-10 Boston Bruins? So, as par the norm, I’m going to bring up the rear with my predictions and thoughts on a topic. But, as they say, we saved the best for last. Most of you might not be aware that, yes, Boston did have a hockey team this decade before 2008, and, yes, they were actually pretty good. The Bruins, in fact, were one of the best regular season teams since the turn of 2000. That did not, obviously, translate to playoff success, winning only the Stanley Cup in 2011, as the most recent flag bearers for the state of Massachusetts. And while the Bruins are certainly the toast of the town, it wasn’t always like this, even though they were a good team. Indeed, the Bruins can be broken down into two categories – pre-Lockout and post-Lockout. The pre-Lockout successes hinged on one formula backed by a player you’ll see on the list. The post-Lockout Bruins traded that player and rebuilt their organization on the fly, suffering a couple of bad years in there. But that’s what makes the turn of the century so fun to analyze and so fun to dissect. Here are the nominees, a little bit more in-depth than Noonan and Lindberg, because you probably haven’t heard some of these names and some of them need explaining as to why they are where they are, OK? Boston had a number of players who were great one-year wonders. They traded for guys to fill out a solid roster but never committed to them for the long haul. Guys like Sergei Gonchar, Bill Guerin and Mike Knuble. They all played for Boston and were solid additions, but they all fled town after their contracts expired, or they were traded when the Bruins front office realized they couldn’t resign them with a cheap owner nickel-and-dime-ing along the way. After the Lockout, this attitude changed with the salary floor and cap, forcing the Bruins to spend money and manage contracts better than before. Needless, to say it paid off. That attention to tenure is why you won’t see guys like Dennis Seidenberg or Nathan Horton on this list. They are great players, but they didn’t do it over too much. It’s possible they make a revised list in a couple of years (Horton, especially), but I’m basing this on how big of an impact the players made on the organization for an extended period of time, and how good the team would’ve been without them. If you remove Horton, the Bruins are still a great team, but that discounts how much they belong on this list. Also, it’s worth noting guys like Marco Sturm, who were brought here to replace big name guys, and, even though they weren’t as good, they were every bit the part they needed to play. They had a number of guys like that, and, once again, they left town. And, finally, the one-year wonder goaltenders. These guys didn’t have the tenure to stick into our list because, let’s face it – the Bruins have never been big on goaltending. Andrew Raycroft put up solid numbers but didn’t play long enough in Boston to warrant a Top 10 rating. Also, Tuukka Rask might be the best goalie the Bruins ever had, but he’s neither done it, nor been consistent enough to be considered in this list. So here are our Top 10 Bruins of the past decade. There are a ton of guys to choose from, all of which were good, some of which were great. Despite everything Savard has endured, he deserved to be on this list. 10: Marc Savard – I really agonized as to where Savard belonged. In my first list, I had Knuble in and Savard out because I didn’t want to pay too much respect to the guys of today. But then I moved Knuble out because he wasn’t here long enough (which is one of my factors in choosing this list – how effective was a guy and how long was he effective?). That led me back to Savard. Savard spent three seasons as the Bruins’ top-line center after coming to Boston from the Atlanta Thrashers. He became the quintessential table-setter, potting just enough goals to be relevant in the category himself while establishing himself as a master assist man. He became the first truly elite center the Bruins had since Joe Thornton. But Savard hasn’t been here long enough, and it’s possible that, unfortunately, his career is over. His career might be reduced to a four-year stretch, where he made an impact then was robbed from us by a thug in a Pittsburgh uniform. It’s eerily similar to Cam Neely, but Neely had been effective for the better part of a decade whereas Savard only had a few moments. He’s in the Top 10 because he was that good. He’s not higher because his career was stunted and possibly cut completely short. We can only deal with what he was, not what he could’ve been, which is a shame unto itself. 9: Milan Lucic – Milan Lucic should be higher on this list. He’s a 30-goal scorer before the age of 23, and his 62 points at 22 years old tied for the team’s lead in a year when the Bruins won their first Stanley Cup since 1972. But the fact remains that Lucic isn’t higher on this list because 2010-2011 was the first time we saw him actually realize some potential. He was a 19-year old rookie for Boston during 2007-2008, and his stats jumped in year number two from 8-19-27 to 17-25-42. In 2009-2010, he got hurt, playing in only 50 games, before roaring back with a vengeance this year. The thing I love most about Lucic is his ability to get into brawls, get penalty minutes, and still score seven game-winning goals. But Lucic can be better. That’s the most amazing thing. He should be better, and he should be doing more. He was badly exposed during the playoffs as somebody who could get caught skating in mud, and he made a couple of really bone-headed plays throughout the Cup run. There’s an element of Lucic that feels like he read too many press clippings saying how awesome he is, and instead of continuing to evolve into the next Cam Neely, he started to level off. As the Bruins begin an era where they’re defending Stanley Cup Champions, my worry is that Lucic is already hitting a plateau in his development at age 22. And that drives him lower on this list than he probably should be. 8: Sergei Samsonov – I remember when the Bruins traded Sergei Samsonov in 2006. It was one of those deals where you knew that the team got absolutely worse, but that it would be better for the long run. The problem was that removing Samsonov from the team during the same time that they traded Joe Thornton essentially destroyed a playoff-caliber team. Samsonov came into the league as a 19-year old dynamo, scoring 22 goals in his rookie year before the turn of the century. After the turn, he continued to put up the same numbers. With the exception of the 2002-2003 season when he was injured, he always scored 20 goals. As a member of the Bruins from 2000-2006, his goal stats were like this – 19, 29, 29, 5, 17, 23, (18 of which were for Boston). He was wildly consistent, and he NEVER had a plus/minus on the wrong side of zero. But that was about it. You knew what you were getting from Samsonov, and you knew what he wasn’t. When the Bruins traded him, you figured it was the end of the road, one of those guys who was a star on one team but wouldn’t amount to much on other teams. And that’s exactly how it played out. Still, Samsonov was the number two guy on the Bruins for over half the decade, and he was arguably the franchise’s second banana during a time when they were a good regular season hockey club. He ranks over Lucic because he’s done it longer, but there’s a very good chance Lucic overtakes him within the next couple of years. Of course, there’s also the chance that he doesn’t because Samsonov has the ability to cast a shadow of consistent, solid play that is hard to live up to. 7: David Krejci – When David Krejci joined the Boston Bruins full-time during the 2007-2008 season, nobody knew that he would turn into the passing machine that he is. Players in hockey tend to get more credit for scoring goals, and it’s easy to miss guys who relish passing and setting up scores. But Krejci’s numbers and ability to take over a game are best served with his numbers in the assist column. In his four full seasons with Boston, he has never notched less than 20 assists. In 2008-2009, he had 22-51-73 totals, with a +37. He was the team’s leading point scorer with Milan Lucic in 2010-2011, and he only scored 13 goals. But Krejci’s true talents have shined during the postseason. In 25 postseason games during the Bruins run to the Cup, he led all players with 12 goals and 23 points. He led all players with four game-winning goals, and he seemed to be around a few more. It was his feed that found Nathan Horton’s stick in Game 7 of the Eastern Conference Finals. And his [+8] rating is more of a tribute to how he plays a true complete game. When Horton went down injured, Krejci made players who filled in on the top line better, including Rich Peverley and Michael Ryder (who both had assists as part of that line). Nobody benefitted more than Peverley, who had three goals in two games as part of that line. Without Krejci, there’s no way these guys would have won the Stanley Cup, and there’s no way that line would’ve been as effective without Horton as it was. The best part is, Krejci is showing signs of improving every year, and he’s only 24. 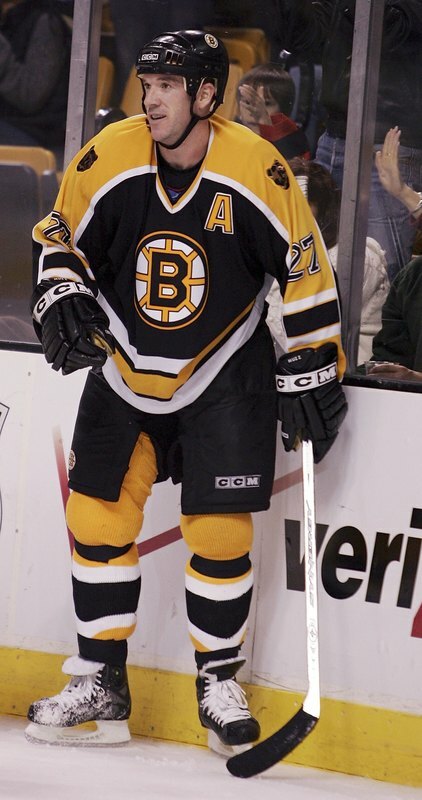 6: Brian Rolston – It’s almost impossible to find a Bruins fan in the early 2000’s that didn’t love Brian Rolston. Coming to Boston in a trade during the 1999-2000 season, Rolston put up monster numbers for the Bruins during the early part of the decade. He had 31 goals in 2001-2002, 59 points in 2002-2003, and ranked third on the 2003-2004 team that had 101 points. He was the master of two-way hockey, scoring nine short-handed (!) goals for the B’s in 2001-2002 ALONE. He never had a plus/minus below zero, and his [+11] for the Bruins in that 01-02 frame ranks as one of the best-earned ratings in the decade. He had four goals for the Bruins during their six-game collapse that season against Montreal in the playoffs, which is more than what “Jumbo Joe” ever did. The thing I don’t like about Rolston is that he wasn’t here very long. After the Lockout, the Bruins let him sign with Minnesota rather than retain his services, and he went onto have three 30-goal seasons for the Wild. It was upsetting as a Bruins fan to see that because of how much I loved watching him plays. There are so few players in the NHL that nobody can say anything bad about. Rolston happens to top that list. How great was Glen Murray? 5: Glen Murray – Glen Murray came to Boston in a trade for top-flight scorer Jason Allison. Murray stuck around long enough to warrant discussion as one of the best players in recent franchise history, let alone just his time. He was a better goal-scorer than both Joe Thornton and Sergei Samsonov. After the Bruins acquired him, he scored 35 goals in 73 games in 2001-2002 (after playing nine for the LA Kings). He then put up 44 goals the following season. Murray continued to play strong for Boston straight through the lockout, even though age started to catch up with him. When the Bruins bottomed out following the NHL Lockout, placing in 5th place in the Northeast Division, trading Thornton and Samsonov, and committing to rebuilding the franchise on the fly, Murray remained a constant. With the lack of developed talent around him, it’s amazing how he flirted with the 30-goal mark, and he was the player that bridged from the Thornton era to the Bergeron-Savard-Chara era. He scored 180 goals during the past decade, and when he retired following the 2007-2008 season, the Bruins had ushered in a new period of relevancy. His last year was the year they nearly knocked off Montreal (Claude Julien‘s first year as coach), and when he retired, he left the franchise in good hands. Arguably, nobody has been more important to the franchise’s rebuilding, and if he wasn’t there to mentor the players and walk off into the sunset, there might not be a Stanley Cup in Boston now. 4: Patrice Bergeron – It’s rare to see a player transform his game so much in so little time. Since debuting as an 18-year old kid from Canada in 2003-2004, Bergie has gone from goal-scoring center to consummate teammate and table-setter. He’s been around for so long, it’s hard to imagine he’s only 25-years-old and still has years of his prime ahead of him. Where does someone begin with Bergeron? He had 31 goals and 42 assists in the first year after the Lockout, on a team that was in the process of blowing itself up. He followed it up with a 48-assist season in 07-08. He lost his 2009 season to a concussion, the beginning of a sad trend that’s seen him miss time. But he’s notched at least 30 assists in every season since, and his 22-35-57 totals this past season were his best since before his concussions started. But Bergeron’s impact goes beyond that. He seems to hover around the puck at the best possible time, and he’s one of the team’s best leaders. He’s not a top-line guy; he’s just not among those guys who play on the top line in what he does on the ice. But if you take him out of your lineup, your team gets substantially worse. When Murray handed the torch off to the new breed, we thought it was originally going to be Savard who picked it up. Instead, it was Bergeron, who became something of an elder statesman in these parts for his tenure with Boston. He gets special merit for being part of the 2010 Gold Medal Team Canada team from the Olympics, a feat no other Bruin experienced. And when you consider the talent in Canada, well… there you go. 3: Joe Thornton – Revisionist history has a funny way of looking at things. People look back on Joe Thornton and say the same things about him that they say about Nomar Garciaparra. He was a great talent, but he was hamstrung by subpar teams that couldn’t win the so-called, “big one.” He disappeared in big games. Nobody was a worse primetime player. He went from being the savior to being an albatross contract. The Bruins had to trade him so they could rebuild. When the Bruins traded Joe Thornton, they essentially aborted and blew up their franchise for three seasons. Nobody, yep, NOBODY, did more for the team. In 2002-2003, he had 101 points, nine more than second place Glen Murray and almost double the third place scorer (Rolston). He redefined the term “table-setting center” with the way he dished out assists. In 2003 and 2004, he notched 50 assists, with 65 in 2002-2003. And he did so while the microscope constantly looked at every one of his moves. Problem was – the critics are right. Thornton disappeared in playoff series. It’s hard to ignore the fact that he was ALWAYS under zero in plus/minus, and he never scored goals. But goal scoring wasn’t his style, and if the Bruins had put more than Glen Murray around him, maybe things would’ve been different. The Bruins were too one-dimensional in those days; decent goaltending, terrible defense, and one-line of Thornton-Murray-pick somebody. They were too easy to stop and not dynamic. And that made Thornton look very bad. When he was traded, the Bruins lost their identity, and he went onto win the league’s MVP Hart Trophy in THAT VERY SEASON as part of San Jose. But, in the end, Jumbo Joe gets credit as the man who brought about relevance during the regular season, something that hadn’t been felt since the era before him, one that sunk them into a position of drafting him to begin with. 2: Zdeno Chara – When the NHL Lockout ended, the Bruins decided to make a big, big, big splash when they signed the best defenseman on the free agent market – literally. Big Z is the tallest player in NHL history, and he gave the Bruins a defenseman they hadn’t had since Raymond Bourque. With the exception of his first season in Boston (which was the year after they traded Thornton and Samsonov and had no offensive weaponry whatsoever), Chara has never been below a +14. In 2010-2011, he was a [+33], which led the league. That means his unit, on the ice, played better lockdown defense than anyone else in the league over that same stretch (overall). That gave the Bruins a new look as a blue-collar, defensive hockey team, something they rarely, if ever, had known. What gets lost on Chara is that he can score goals. He nearly potted 20 a few years ago, and he scored two this year as the Bruins won the Cup. In the playoffs, he was the polar opposite of Thornton, putting a [+19] on the board through 24 games. Assigned the captaincy, he’s played the game under a larger microscope than many. Given a maximum contract, he’s the first move that ushered in an era where the Bruins were not afraid to make moves and sign players. The Bruins brought him in to have attitude while not making too many dumb moves, and his fight with David Koci set the stage for things to come (YouTube it – Koci ends up bleeding all over the ice). He can be the lightning rod, evidenced with the Max Pacioretty incident, and he can absorb the blows. Nobody (except for one person) is as irreplaceable on that 2011 Stanley Cup Champion as Chara. Without him, the Bruins not only never win the Cup, but also they probably don’t even come remotely close. Tim Thomas was superb in the postseason for the Bruins. 1) Impact. Thomas won two Vezina Awards for the Bruins, in 2008-2009 and 2010-2011. He’s only the second Bruin to win the Conn Smythe Trophy (the other being Bobby Orr), and he won it by stopping a record amount of pucks throughout the playoffs. In 2010-2011, he posted a 1.98 GAA (bettered only by his 2008-2009 level of 1.85). He posted four shutouts. He beat up Alex Burrows and Henrik Sedin. And he did so smiling the whole time, even though at the beginning of his career, the Bruins signed a number of guys to replace him. 2) Longevity. Disregarding a cup of coffee with the Bruins in 2002-2003, Thomas outlasted Andrew Raycroft, Hannu Toivonen, Felix Potvin, Manny Fernandez, and Tuukka Rask to reclaim his starting role. He has 158 wins over six season (more than half the turn of the century), and he’s given the Bruins their first goalie of this caliber since Andy Moog. 3) How would the team fare without him? Well… there’s a case that Rask is every bit as good as Thomas, especially after the way Tuukka played in the 2010 Stanley Cup Playoffs. But Rask suffered through a rough patch in 2010-2011, which opened the door for Thomas to step back in. Honestly, without Thomas, the team isn’t as much of a contender; maybe they make the playoffs, but can you really argue the fact that he may have single-handedly won them the Stanley Cup? Think about all the guys and how they could be, and in some cases were, replaceable. Now look at Thomas. During those scoreless games, every shot that was put on net, you thought it’d be stopped. You KNEW you could win every single game because of him. And when they lost, you usually said, “They can win this game.” They weren’t outclassed at all by anybody. And it’s because they had a goaltender. 4) Lasting Impact. 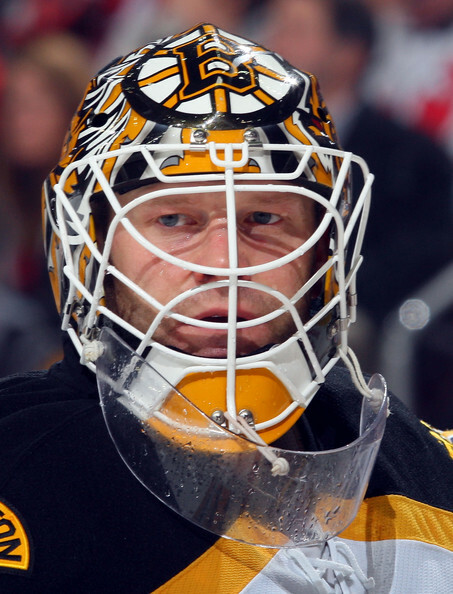 Nobody can replace Tim Thomas in Boston lore at this point. He’s in the echelon no Bruin other than Orr occupied. When Thomas is listed among Bird, Orr, and Brady – he’s done something more than Chara, Thornton, Bourque, Neely, and anyone else who’s played for the Boston Bruins. And that’s why, without a doubt, Tim Thomas is number one.